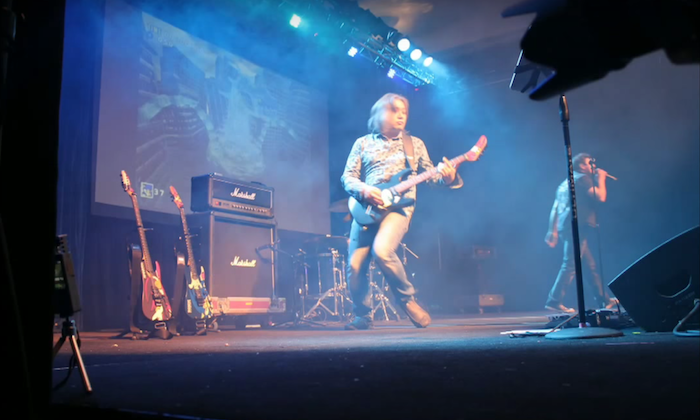 Check Out Crush 40’s Awesome Performance at Youmacon 2015! Hanging on the edge of tomorrow, from the works of yesterday! Crush 40 as we know them today has been gracing our ears since “Open Your Heart” in 1998’s Sonic Adventure, and set a new standard for music throughout the following line of Sonic the Hedgehog games – nearly every main Sonic title released since the Dreamcast era has been accompanied with a memorable theme tune of some sort. Most popularly, fans of both the band and the series would immediately think of “Live and Learn” from Sonic Adventure 2, “What I’m Made Of” from the final boss battle against the Metal Overlord in Sonic Heroes, or even “Knight of the Wind” from Sonic and the Black Knight, all performed by vocalist Johnny Gioeli, and Sonic music composer-slash-guitarist Jun Senoue. The duo have performed at a number of fan venues over the years, namely the Summer of Sonic and Sonic Boom conventions, but most recently, the pair was confirmed to perform live at the recent Youmacon in Detroit. While awesome news, a good many were understandably bummed at missing such a wonderful opportunity to see them live. IXI! Studios of Toronto, Canada travelled to the Detroit convention and managed to capture an hour of footage from Crush 40’s Youmacon show! Rock out to a plethora of classic Sonic tunes and miss their concert no longer through the video below! While at Youmacon 2015, the convention-hopping IXI! Studios (who have travelled to previous MAGFests, ConBravos, and Anime Norths among others) have also managed to film the Team Four Star panel (including the premiere of the new Dragon Ball Z Abridged episode, parodying the movie Super Android 13), the two Little Kuriboh Q&As (Yu-Gi-Oh Abridged episode 65 premiere, Secret Panel), and the Elite 3 panel featuring the Pokémon ‘Bridged 23 debut. I was pretty awesome! Listened to it while working today, it was a cool performance with a very enthusiastic vibe from Crush 40 and the audience! Also the projections of Sonic games were a nice touch. They’re putting on this great performance, yet all the crowd does is hold their phones up and record the whole time. Whatever happened to enjoying things in the moment? *sigh* It’s all in good spirit I suppose. Though that was more in the begining, near the middle the crowd got more into it, also it gave me chills how everyone started singing along Live & Learn! They cannot resist the rhythm! That’s good to hear. My question is how are they even relevant anymore? They represent a type of Sonic franchise that no longer exists and they don’t fit in whatsoever with the Colors-Onward games. I mean, maybe if the series suddenly went back to what it used to be all about, sure. But nowadays all anyone can do is follow this bands fart trail hoping to catch a whiff of what once was. It’d be awesome if they returned, but at this rate they’re basically just fan fooder at conventions to get people to show up. Well somebody almost choked on a wishbone today. #InB4Salty4MySA3 Lol. SEGA has a cool in-house PG rated rock band that has a loyal following, so of course they’re gonna flaunt them whenever they can. It’s not they can fly out Takenobu Mitsuyoshi and The H Live Band over from Japan instead. Does it really matter if they’re not promoting a Sonic game…hell, it be better for the band if they bring more focus on their original work rather than sing “Live and Learn” for the millionth time. Their take on “Fire Woman” is so good, fans have been asking to make that Blaze’s theme. Hey! Thanks for letting me know about that song! Though I kind of disagree about Sonic being like he was in the 16 bits era, those were a much simpler days so the story was over simplified, Sonic has evolved since then so I think it would be a total waste to throw all those years of evolution to the trash and for what? Because “general public is more tolerant to it”? Instead of elevating Sonic to a form most people (fans and general public alike) would like and feel passion for? Maybe the Adventure kind isn’t the best way to accomplish that but returning to the 16 bit era would be a total harakiri.